The Purpose Arbitration Serves For Movers? Arbitration Programs For Movers > What is moving arbitration for? The purpose of Moving Arbitration is to make sure claims from customers towards moving companies are not sent to small claims court. It also ensures that there is an efficient and effective process for determining whether or not a moving company is responsible for damage or loss. When moving arbitration settles a claim, an arbitrator takes care of the claim. This saves moving companies and customers from the legal fees required to go to small claims court. This also helps prevent overcrowding of cases in courts. By purchasing an arbitration program from us, you can be protected from false claims. Arbitration programs are run by professionals who are informed about the laws regarding moving goods from locally and from state to state. By being part of an arbitration program, you will have the expertise of these professionals in the case of a claim. See the difference it will make when you watch this video. Having arbitration will save you money in legal fees and will make sure your company is compliant within the laws of moving household goods. Moving companies must be a part of one to legally operate in the United States. Clients have the option of using the moving arbitration program that the moving company is a part of. But, they have to use the arbitration program if they choose not to. Clients can still go to small claims court if they think their situation requires it. The program is in place to make sure that most disputes are settled in an easy and efficient manner. Most claims should be solved by the use of the arbitration program. But for special cases, there are other options available to solve the dispute. 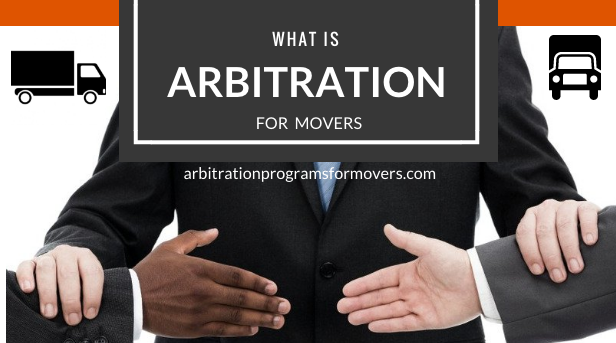 There are thousands of moving companies in the United States that are part of an arbitration program. But, there are also many moving companies who are not part of one. Moving companies who are not part of an arbitration program are operating illegally. These companies are in danger of getting a fine or shut down by the FMCSA. By not being part of an arbitration program, you are not providing insurance to your customers in case you damage or lose their items. So, what does it mean to be a part of an arbitration program? Being part of arbitration programs means that your moving company is under certain laws and regulations. For moving companies, it is a small price to pay to be a legal mover. Our arbitration program only costs movers $185 a year to be a part of. The arbitrators of the program are very easy to work with. They never have a bias towards one party or the other. All it takes to sign up is the click of the button on the top right-hand corner of the site. Don’t wait. Get arbitration now!